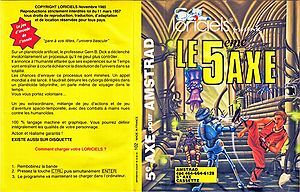 Blending frantic beat-em-up action with platforming, Le 5eme Axe was one of the earliest titles to cross the channel and prove to British software magazines and consumers that the French were on to something with their own software development! You have been selected as the only humanoid capable of succeeding in a mission of vital importance to the survival of the galaxy. All the available information on your mission is contained in this communication. Please study it carefully before commencing. Codename for this mission is Fifth Axis. Six months ago, Professor Chronos of the Vesta Institute of Temporal Studies, reached the culmination of his life's work. The creation of a vehicle capable of moving backwards and forwards in time. During his research, Chronos had discovered that the universe was contained not within the four recognised axes but within five. The fifth axis governs the probability of events happening within the universe. From this research he concluded that there was not just one reality, but an infinite number of probable realities. For Chronos the danger of a Temporal Paradox did not exist. He reasoned that, if you went back in time and killed one of your own ancestors, you would not cease to exist. Instead, another reality would branch from that point, one in which you did not exist, but your own world would remain unchanged. Based on his deductions of the nature of the universe, he commenced trips back in time to recover historical artefacts assuming that his tamperings would be balanced in one of the other probable universes. He did not realise that his actions were jeopardising the very reality of his own universe. It was during one of these trips back in time with his assitant at the controls that the time machine malfunctioned and exploded, scattering its component parts (and those of its unfortunate occupants) throughout all time. This detonation and the appearance of the fragmented time machine (referred to as anachronons) was too much for the fabric of the universe to stand. There had been too many tamperings in the one time liner. Contrary to Professor Chronos' belief, more realities are not created. Instead the universe has started to rotate around its fifth axis to bring reality back into balance. The present as we know it is becoming less likely the more the universe rotates. The only way to reverse this shift is to collect all the artefacts from Chronos' lab and return them to their correct times and bring back the anachronons. Only when this is complete will reality become fixed once more. To help you, Professor Chronos has developed a second time based on his new Vectoral Propulsion System to aid you. Be warned also that in the laboratory the instability is maximised and has caused the professor's cyborgs to run wild. They will attack you on sight. This game is a port from a Thomson MO5 game of the same name. It features some impressive raster effects, quite rare on CPC when this game was released. It was a way to reproduce the attributes from the MO5/TO7 version. The game also includes some Sampled / digitalised sounds. This page was last modified on 23 August 2015, at 19:02.